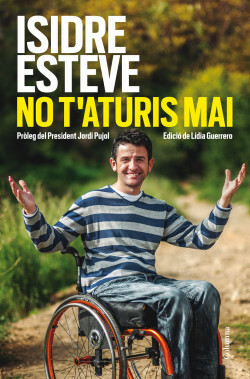 Four years ago, Isidre presented La sort del meu destí, a book that spoke about his experiences yet from that experience he was able to draw universal reflections. The book was a lesson in optimism, purity of mind, serenity, showing his willingness to struggle, work hard and overcome. His is a relentless search for new goals, a perfect balance between inner peace and constant dissatisfaction, a continual quest for improvement, and his basic need to keep moving. Don’t ever stop shows that Isidre’s optimism after the accidentwas not a passing response, but the seed of something deeper, the beginning of a new phase in his life consistent with his values, his struggles to improve and overcome, and his authentic and moving appreciation of all life has to offer. The testimony of a very determined and positive person, used to working hard to surmount obstacles, and who will not ever stop in his search for new finish lines to cross.